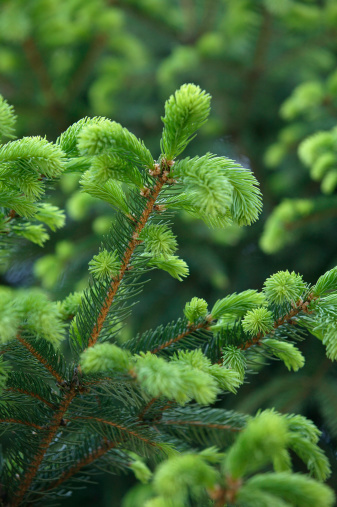 While proper care can stimulate your evergreens, the key to success is preparation. If you crowd saplings or choose a site with few soil nutrients, your trees may never thrive. Once planted, moving a conifer can result in transplant shock and endanger the tree. Planting an evergreen too deep often results in tree death. However, if you have followed the nursery's precise planting instructions, you can nurture young evergreens and keep them healthy year-round. 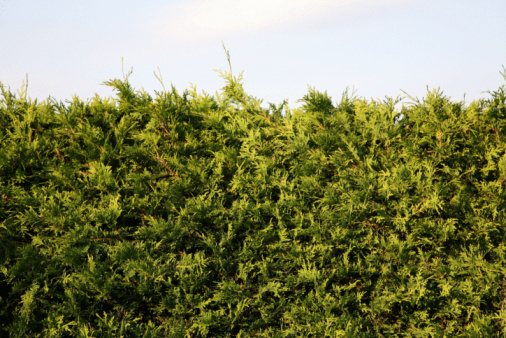 Remove the sod that surrounds the evergreen with a shovel. Your goal is to eliminate any grass that would compete with the tree for water. Take out all of the sod that grows below the tree and 1 foot beyond the drip line. Sprinkle a fertilizer around the base of the tree. Use a 10-8-6 quick-release formulation during April, May, June or early July. Between July 15 and October 15, choose a slow-release 10-8-6 fertilizer instead, so that you do not encourage too much growth before winter. Follow the package instructions to determine the correct amount to apply. In general, use about 1/3 pound of fertilizer for every foot in height; for example, a 3-foot tree requires 1 pound of fertilizer. Water the fertilizer in with a hose. Some fertilizer pellets may remain visible on the surface of the soil. Apply mulch around the tree, completely filling the area where you removed the sod. Your blanket of mulch should be 4 inches deep. However, do not allow the mulch to directly touch the trunk of the tree; keep the mulch three to four inches away from the trunk. Any organic mulch will suffice; wood chips, peat moss, manure and pine needles all work effectively.